More Oconee County voters cast Republican ballots in early voting for the runoff elections that ended Friday than cast Republican ballots during early voting for the party primaries in May. That was true even though there was one fewer days of early voting in the runoff because of the July 4 holiday and no Saturday voting. 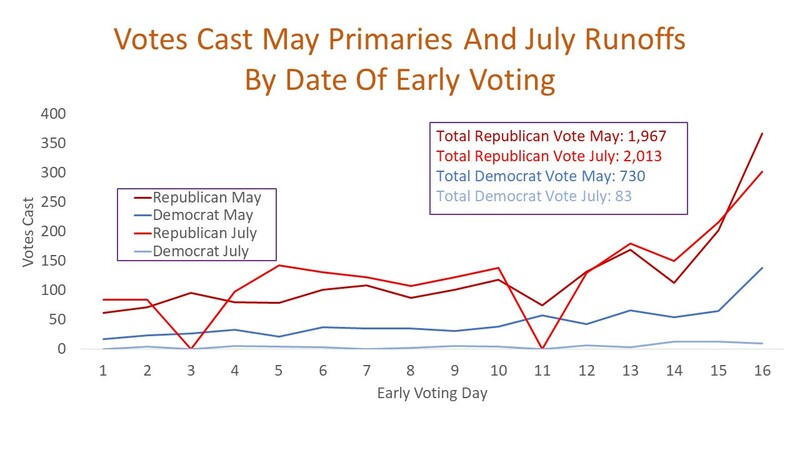 In the 14 days of early voting that ended yesterday, 2,103 voters cast Republic Party ballots, compared with the 1,967 voters who cast Republican ballots in the 16 days of early voting before the May 22 primary. Overall, the county recorded 617 fewer votes in early voting for the runoffs than in early voting for the May primaries largely because only 83 Democrats cast a ballot in the July early voting. Republicans have three top-ticket races on the ballot to be decided in the runoff election on Tuesday–for governor, for lieutenant governor, and for secretary of state. Democrats will decide only the state school superintendent race. Voting on Tuesday at the county’s 13 precincts will be from 7 a.m to 7 p.m.
A total of 312 voters cast ballots Friday in the heaviest day of early voting for the primary runoffs. Of those 312 voters, almost all–302–cast a Republican ballot. The heaviest day of early voting in the May 22 primaries also was on the final day, when 509 people voted, but 139 of those cast a Democratic ballot, and three voted only in the nonpartisan judicial races. Voters who participated in the May 22 General Primary Election must choose the same party ballot for voting in the run-off election as in the primary. Those registered voters who did not vote in the May 22 General Primary Election can choose either party ballot in the runoff. All of the turnout numbers used in the chart above were provided by Fran Davis and Jennifer Stone, director and assistant director, respectively, of the Oconee County Board of Elections and Registration. In May, 5,769 Oconee County voters cast a Republican ballot, with 34.1 percent of those participating in early voting. That suggests turnout could be quite high on Tuesday in the Republican Party Primary Runoff. In May, 1,978 Oconee County voters used the Democratic ballot. Of those, 36.9 percent cast a ballot in early voting. A high voter turnout for Oconee County Democrats seems quite unlikely on Tuesday. 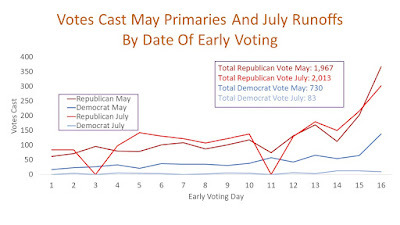 No early voting took place on July 4 (day three of early voting in the chart above), and there was no Saturday voting during the July early voting period, as there had been (on May 12) in early voting before the May 22 primaries. May 12 was day 11 of early voting in the chart. Oconee County had 28,284 registered voters eligible to participate in the May 22 primary, including those classified as both active and inactive. That included 26,260 active voters. That number of active and inactive voters was 28,214 when early voting for the runoff started on July 2. An inactive voter becomes active when she or he votes, and the number of active voters after the May 22 primary was 26,261. The turnout rate in May, computed as the number of Republican and Democratic voters divided by the number of active voters, was 28.4 percent. L.S. “Casey” Cagle and Brian Kemp are seeking the Republican nomination for governor in a hotly contested race. Cagle is now lieutenant governor, and Kemp is secretary of state. Gov. Nathan Deal endorsed Cagle this week, and President Donald Trump endorsed Kemp. Cagle, from Gainesville, got 39.0 percent of the vote in the May 22 Republican Primary statewide, but he got only 22.2 percent of the vote in Oconee County. Kemp got 25.6 percent of the vote across Georgia and 53.9 percent of the vote in Oconee County. Reflecting that Oconee County tilt, Tammy Gilland, chair of the Oconee County Republican Party, has called for volunteers to work for Kemp from the podium in several local party meetings, including the most recent one, and no one from the audience has objected. Kemp is from Athens, and he got 52.4 percent of the Republican vote in the May 22 primary in Clarke County. The winner of the Republican Primary Runoff on Tuesday will face Democrat Stacey Abrams, from Atlanta, in November. Geoff Duncan, a businessman from Forsyth County, and David Shafer, a businessman from Gwinnett County, are the two Republican candidates in the runoff for lieutenant governor. Duncan got 24.8 percent of the vote in Oconee County in May, and Shafer got 54.6 percent. Across the state, Duncan got 26.7 percent of the vote and Shafer got 48.9 percent. David Belle Isle, former Marietta mayor, and Brad Raffensperger, businessman from Johns Creek, are competing for the Republican Party nomination for Secretary of State. In the May primary, Isle got 20.6 percent of the vote in Oconee County, while Raffensperger got 49.0. In the state overall, Isle had 28.5 percent of the vote to 35.0 percent for Raffensperger. The Republican nominee for lieutenant governor will face Democrat Sarah Riggs Amico, a Kennesaw businesswoman, in November. The Republican nominee for secretary of state will face John Barrow, the Democratic nominee, in November. Former Congressman Barrow is from Athens. The sole Democratic race on the ballot on Tuesday is between Sid Chapman and Otha Thornton Jr. for state school superintendent. Chapman is a former high school teacher and president of the Georgia Association of Educators, and Thornton is a retired Army officer and former president of the National Parent Teacher Association. Chapman got 43.6 percent of the vote in May in Oconee County, to 36.2 percent for Thornton. Statewide, Chapman got 36.5 percent of the vote to Thornton’s 43.9 percent. Michael Prochaska, editor of The Oconee Enterprise announced Friday that the paper will host a candidate forum for local candidates in the Nov. 6 general election from 6:30 to 7:30 p.m. on Oct. 4 at the University of North Georgia campus on Experiment Station Road. Prochaska said that all four Board of Education candidates and all six state legislative candidates representing Oconee County have agreed to attend. The format will include introductory comments from the candidates followed by questions from the audience. Either Prochaska or someone selected by Prochaska will moderate.